Ivan Sippy tackles a steep descent in Dalla Mountain Park during a race simulation workout with Durango Devo. Though he isn’t racing at nationals, Sippy said he is excited for the National Interscholastic Cycling Association high school mountain bike series this fall. Ben Sonntag chases Riley Amos during a race simulation workout with Durango Devo. Later this month, Amos is headed to the USA Cycling Mountain Bike National Championships, while Sonntag is going to his home country of Germany for their national championships. 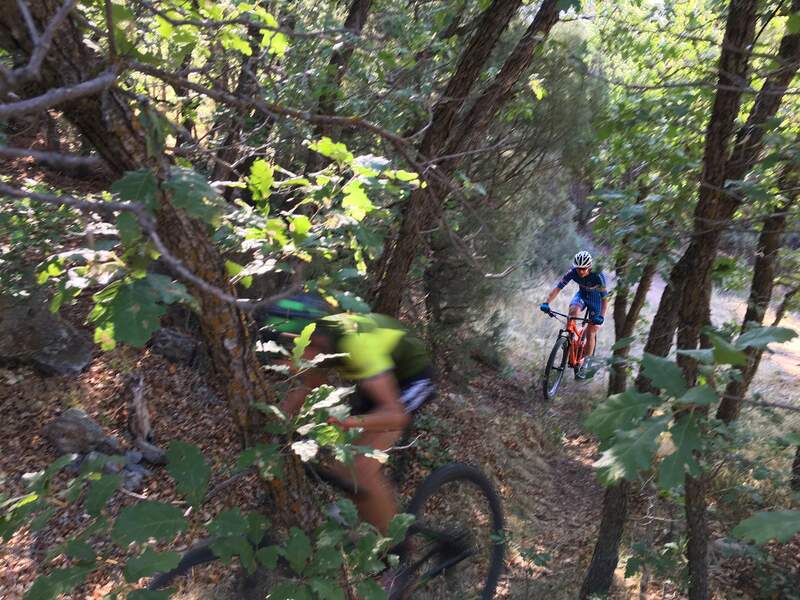 Early Wednesday morning, Durango Devo riders pushed their lungs to the limit climbing a dirt road and then skipped their way through rock-strewn singletrack descents. It was all part of final preparations for the USA Cycling Mountain Bike National Championships that are only a week away. The prize of being considered the fastest in the country in their category – and wearing the stars and stripes jersey for a year – would be a highlight of the season for the young racers who have already seen success this year. But for many, the events July 17-22 at Snowshoe Mountain in West Virginia will be their first time racing at a national championship event. Plus, a hefty plane ride to the unfamiliar conditions in West Virginia could pose a challenge. 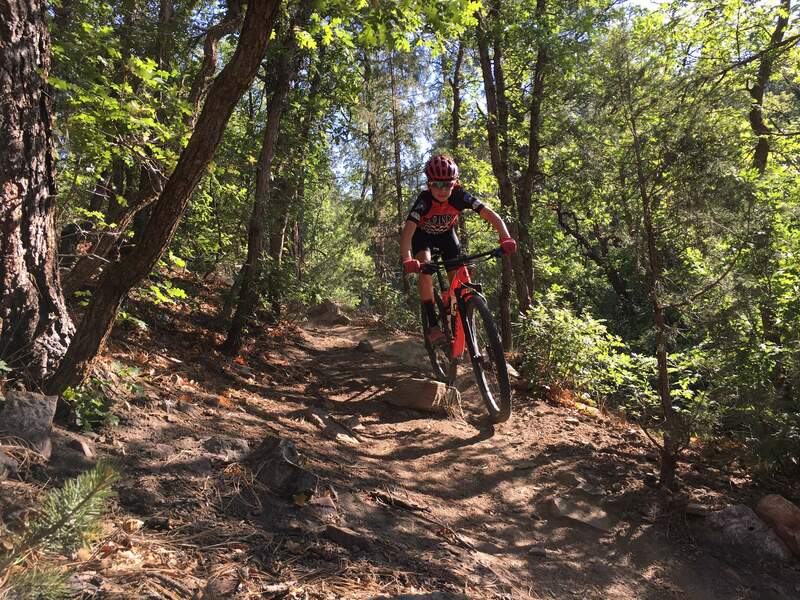 The mountain bikers are used to traveling across the West to race against the country’s top tier talent in the USA Cycling Pro XCT series and other smaller events. In a cross-country mountain bike race, riders must balance fitness – in both high-power efforts and endurance for the races that can last over an hour – with technical skills, said junior riders Lauren Aggeler and Sage Davis said. Sage Davis rides a technical section of Dalla Mountain Park during a race simulation workout with Durango Devo. 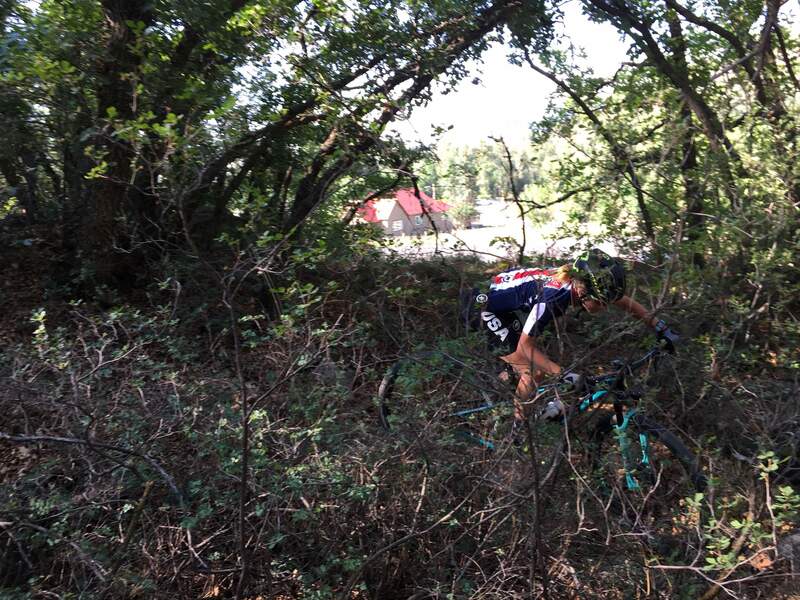 Davis says she has been working on her technical riding skills in preparation for the USA Cycling Mountain Bike National Championships in West Virginia later this month. Dalla Mountain Park, where the riders staged their ride Wednesday, is an ideal location for creating a training circuit. Durango Devo coach Chad Cheeney said the drill is for mental training more than physical. It put the athletes in a race environment on similar terrain. Junior men’s rider Riley Amos said it was helpful to practice riding hard through technical terrain. He also said it is beneficial to train alongside teammates. The group, head-to-head atmosphere provides motivation to push harder than when training solo. Amos is in the midst of a strong season. He won in Soldier Hollow, Utah, and Missoula, Montana, on the Pro XCT series and swept to the Iron Horse Bicycle Classic road and mountain bike races. In addition to domestic racing, Maddie Jo Robbins has international aspirations. She took a pair of third place finishes and a fifth place finish during the Canada Cup series while representing USA Cycling. She is hoping to make the selection to represent the United States at the UCI World Championships in Switzerland. 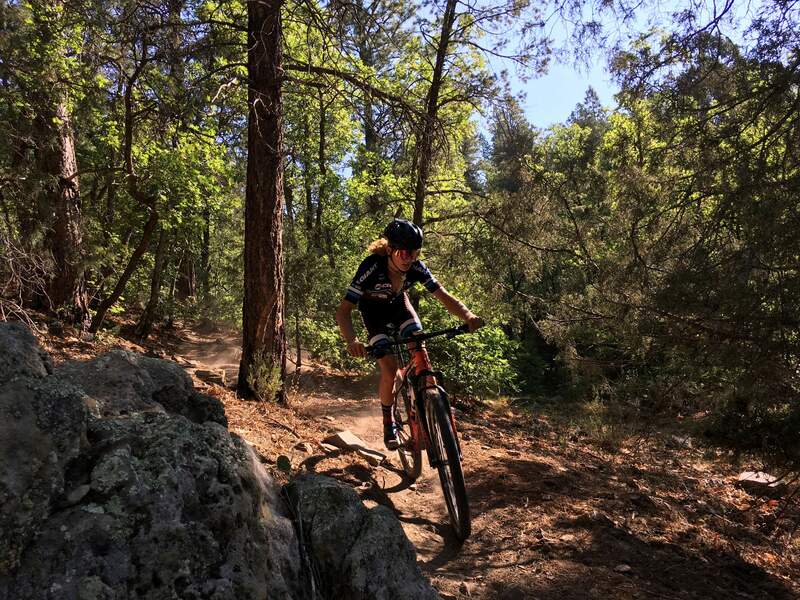 Season highlights for Aggeler, who races in the junior 13-14 girls division, have been winning at Soldier Hollow as well as winning both the mountain bike and road race for her category at the Iron Horse Bicycle Classic. Aggeler said she has focused on interval training, both on the road and mountain bike, in the lead up to nationals. On the other hand, Davis said she has worked to improve her endurance and technical riding. Ian Kutzleb tackles a steep descent in Dalla Mountain Park during a race simulation workout with Durango Devo. Davis said a main challenge at nationals could be unfamiliar conditions. The venue at Snowshoe Mountain is a couple thousand feet of elevation lower than Durango, and race day could be humid and muddy. Cheeney knows the start of the race at nationals is essential. At previous races there, the start line was very close to the first singletrack section, meaning a holeshot was crucial. Demonstrating the close-knit nature of the Durango cycling community, local professional rider Benjamin Sonntag joined the Devo riders Wednesday. Sonntag used the training opportunity to prepare for the national championship race in Germany, where he grew up. Sonntag said the opportunity to race in the German nationals, plus two other races, means he will miss the Leadville 100 race this year, where he finished fourth in 2016. After nationals, many Devo riders will anticipate the start of the National Interscholastic Cycling Association series of high school mountain bike races in the fall. To top off the NICA season, the Colorado Cycling League championships will be held in Durango at Ewing Mesa. Cheeney estimates that across all disciplines and abilities, there will be about 20 Durangoans racing in West Virginia, from defending national champions such as Christopher Blevins, Howard Grotts and Quinn Simmons to the aspiring champions who participated in Wednesday’s team ride.